, a man distinguished in the musical world, was born in 1613. He was a stationer and a seller of musical instruments, music-books, and musicpaper, and was clerk of the Temple church. What his education had been, is not known; but that he had attained to a considerable proficiency in the practice of music and musical composition, is certain. His skill in music was not so great as to entitle him to the appellation of a master; he knew nothing of the theory of the science, but was very well versed in the practice, and understood the rules of composition well enough to write good harmony. He was also the first and the most intelligent printer of music during the seventeenth century; and he and his son Henry, appear, without a special licence, or authorized monopoly, to have had almost the whole business of furnishing the nation with musical instruments, music books, and music paper, to themselves. In 1655 he published the first edition of his “Introduction to the Skill of Music,” a compendium compiled from Morley, Butler, and other more bulky and abstruse books, which had so rapid a sale, that in 1683 ten editions of it had been circulated through the kingdom. 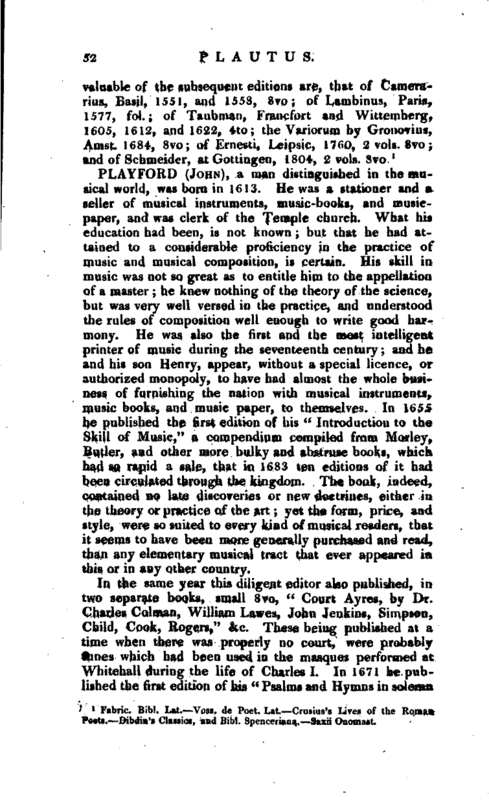 The book, indeed, contained no late discoveries or new doctrines, either in the theory or practice of the art; yet the form, price, and style, were so suited to every kind of musical readers, that it seems to have been more generally purchased and read, than any elementary musical tract that ever appeared in this or in any other country. 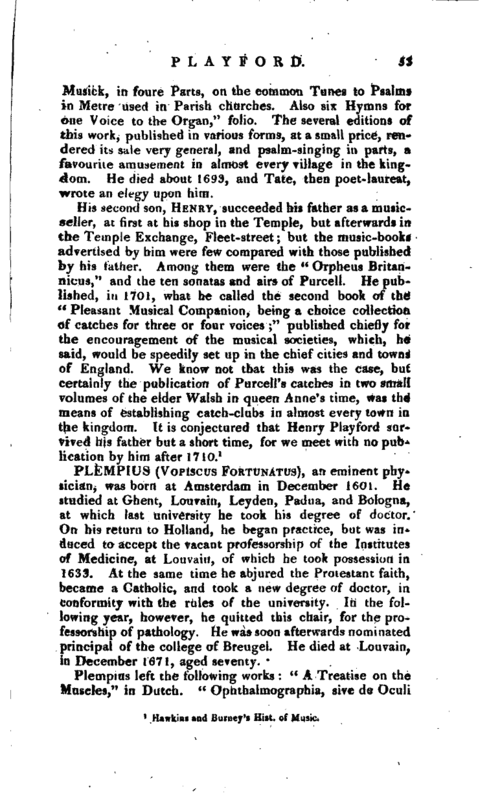 In the same year this diligent editor also published, in two separate books, small 8vo, “Court Ayres, by Dr. Charles Colman, William Lawes, John Jenkins, Simpson, Child, Cook, Rogers,” &c. These being published at a time when there was properly no court, were probably tunes which had been used in the masques performed at Whitehall during the life of Charles I. In 1671 he published the first edition of his “Psalms and Hymns in solemn | Musick, in foure Parts, on the common Tunes to Psalms in Metre used in Parish churches. Also six Hymns for one Voice to the Organ,” folio. The several editions of this work, published in various forms, at a small price, rendered its sale very general, and psalm-singing in parts, a favourite amusement in almost every village in the kingdom. He died about 1693, and Tate, then poet-laureat, wrote an elegy upon him. 1 Hawkins and Buruey’s Hist, of Music.